Don't be fooled by St. Paul United's losing record. United proved it will be a contender for a fourth consecutive section title with a 5-3 victory over South St. Paul, ranked No. 4 in the Class 1A state coaches' poll, at Drake Arena Saturday. "Records are records," said United forward Sammie Sabin, a junior who scored two of her team's goals Saturday. "Winning and losing depends on who comes to the rink that day and wants it more." And that desire for success has not dimmed for United despite a 10-12-2 season record. The losing mark stems in large part from an extremely difficult schedule. United has played four of the top six Class 2A teams in the current state coaches' poll — No. 1 Blake two times, No. 2 Edina, No. 4 Andover and No. 6 Wayzata — as well as facing Breck, the No. 2 team in Class 1A. "When you go against tough teams, those games are tough to play — and people forget that they're tough to recover from, too," United coach Mark Johnson said. "Our record may not show what this team can do, but we hope that this game did." United got off to a fast start Saturday thanks in part to Sabin, who scored exactly one minute into the contest. "Getting one right off the bat is a great way to start," she said. "It can light a fire under a team and get them excited for the next shift to come. It shows that we can compete with them, so it's very motivational." And United quickly added to its advantage when Jenna Hoops scored at 5:18 of the period. "We talked about a fast start — and it went the other direction on us," South St. Paul coach Dave Palmquist said. "Credit to St. Paul United: When we would cut [the lead] to one goal and get some momentum going, they would create chances by getting pucks and traffic to the net." Also credit United goalie Kenzie Giese, a senior who kept her team in front despite facing a number of quality scoring chances from the Packers. "She just stayed solid," Johnson said of Giese, who finished with 30 saves in the contest. "She didn't make spectacular saves because she always was in the right position, so she didn't need to be spectacular. And that helps a team gain confidence as well." Giese faced 14 shots in the first period alone and allowed just one goal, a power-play marker by Gabby Madigan at 14:20. "I was trying to stay as mentally focused as possible," Giese said. "I had a lot of positive self-talk, and I focused in on the puck instead of what was happening in the stands." Meanwhile United re-established a two-goal lead when Lucie Bond scored with just 1:52 to play in the opening period, giving United three goals on just seven shots. "Our girls wait for mistakes — and when a team makes a mistake, we jump on them," Johnson said. "It shows that our team is looking for opportunities and taking advantage of them." It also set a tone for the rest of the contest: When South St. Paul would score a goal, United found a way to respond with a goal to avoid a tie. "We talk about not letting anything get us down," Johnson said. "When a goal happens, you have to keep fighting and not get away from your game plan. If our game plan and intensity stays the same, we'll be fine." Sabin agreed, adding, "You have to shake it off when the other team scores. You can't let it affect you physically, and you can't let it affect you mentally. You have to push through and get that goal back." And United did that twice. When the Packers' Clair Lehmann scored at the 4:01 mark of the second period, Sabin scored just after a power play ended to give United a 4-2 lead after two periods. 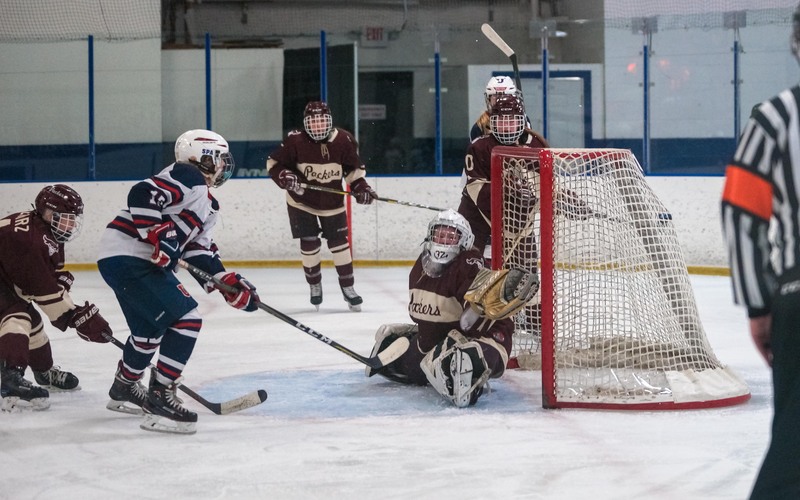 Then Savannah Lenarz scored for South St. Paul at 5:57 of the final period, only to see a shot from the point by Eleanor Winges avoid traffic and evade South St. Paul netminder Delaney Norman, who finished with 17 saves, with just 6:16 remaining. "With eight minutes to go in the game, they were pouring it on," Johnson said. "So that goal was really big. It really showed how much confidence these girls are gaining and how hard they are working. It was nice to see how well they responded." The loss snapped a seven-game unbeaten streak for the Packers, who are now 15-6-3 on the season. During that streak South St. Paul had outscored its opponents 29-10 and risen to No. 4 in Class 1A. "I hope this game woke us up and made us realize we have to be a lot better," Palmquist said. Johnson said he hopes the game helps his team realize it can play with anybody. "Our record may not be as good as the record for other teams, but these girls are getting better every game," he said. 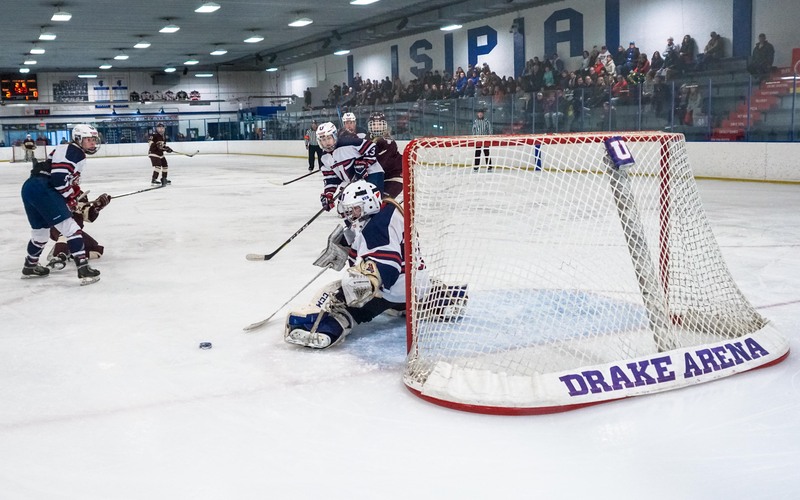 St. Paul United scored three goals in the opening period and skated to a 5-3 victory over crosstown foe South St. Paul at Drake Arena on Saturday afternoon. Sammie Sabin had two goals to lead the offense for United (10-12-2, 1-4-2). Jenna Hoops, Lucie Bond and Eleanor Winges tallied the other goals for United, en route to ending the Packers’ seven-game unbeaten streak. South St. Paul, ranked No. 4 in the Class 1A coaches’ poll, got a power-play goal from Gabby Madigan and an even-strength marker from Savannah Lenarz. 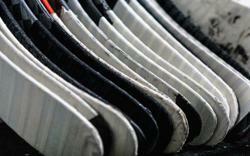 Kenzie Giese finished with 30 saves for United, while Delaney Norman stopped 17 shots for the Packers (15-6-3, 7-0-2).